Marissa Farrar: Denied (The Monster Trilogy, Book Two) Cover Reveal and Pre-order! 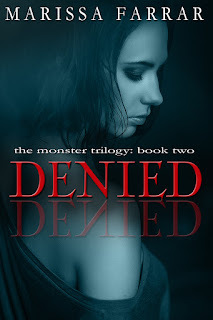 Denied (The Monster Trilogy, Book Two) Cover Reveal and Pre-order! Here it is! The cover for Denied the second book in my dark romance Monster trilogy.. I hope you all like it! After Monster makes an impossible choice that throws her world into chaos, Lily finds herself back in America. Unable to allow what happened to her to go unpunished, and riddled with survivor’s guilt, Lily decides she needs to track down the traffickers who took her. Monster has only ever wanted to keep his Flower safe, but, when he hears of her plans, he is forced to take control once more. Stepping out of his comfort zone, he vows to once more make her his captive. You can pre-order ‘Denied’ now from Amazon, Apple, and Kobo, and other stores shortly. The official publication date is March 29th 2016! If you want to check out the first book, ‘Defaced’, it is also available from all the main online stores, including Amazon, Apple, and Barnes & Noble, in both in ebook and paperback.